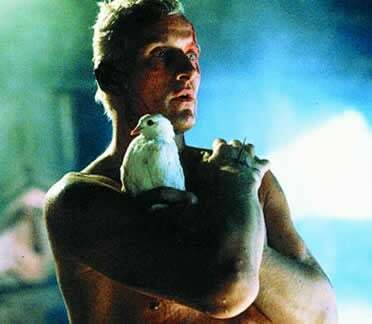 Roy Batty, one of the are-they-cyborgs-or-what Replicants, from Blade Runner. Pris, the other one of Blade Runner's ambiguously cyborg Replicants. Kryten from Red Dwarf (1988). Donald Pierce, a cyborg X-Men villain and bona fide dandy. Bionic Commando, classic Nintendo game cover art. Pearl Prophet, the titualar Cyborg from the Jean Claude Van Damme movie Cyborg (1989). Cover art for Cyborg Hunter, a SEGA master system game (1988). One of the most famous cyborgs of the 1970s and 1980s, unmasked — from a figure replica. Lobot from Star Wars: The Empire Strikes Back. Dr. Arkeville, the only human character in the Transfomers show ever to sell out to the Decepticons (1984). The Witch Queen, from Michael Jackson's infamous Captain EO Disney 3-D movie. Cyborg, one of the most crucial members of DC's New Titans.